The first Nicholas Sparks book I ever read was in seventh grade. As someone who has always been a hopeless romantic I absolutely loved devouring every book he had previously released. Throughout the years I've kept up with his novels reading them immediately once they are released. Nicholas Sparks most recent book was released earlier this month and only took me two days to complete. 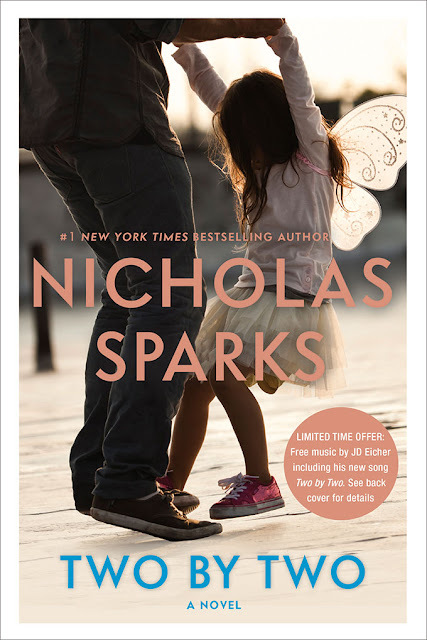 Two By Two I found to be pretty different from all previous Nicholas Sparks novels. The story involves Russell, his wife Vivian, and their daughter London who live in North Carolina. Their world is turned upside down when Russell decides to leave his job and start working at home for himself. Vivian decides to head back to work which involves a complete change of roles in their household. Russell finds himself home most days with his daughter taking on the sole responsibility of carting her to and from her activities and caring for her. London and Russell develop an amazing bond while Vivian seems to be drifting further and further from her family. I won't spoil the book for you, but throughout the majority of it I really hated Vivian. She was a deplorable character who was extremely controlling and I couldn't see a single good quality that Russell seemed to find in her. However, their relationship is not the only one this novel focuses on. Russell's relationships with his parents and sister are explored as well. Overall, this is a book I would highly recommend if you love a good, easy read. There is plenty of drama but also many heart-warming moments that left me tearing up.